Go north from the Hancock County Courthouse on Hwy 15 for 6.6 miles. The cemetery is on the left behind the church. This church was originally Presbyterian but eventually became Methodist. The Mount Zion Presbyterian Church was organized in 1813. $700 was raised in 1814 to complete the building. Services were held here until 1903 when the membership had dwindled from 130 to less than 10. That year the Church property was sold to the trustees of the Mt. Zion Methodist Church for $200. The Methodists worshipped here until 1958. From 1958 until 1969, the church was silent and empty, except for an occasional wedding or funeral. 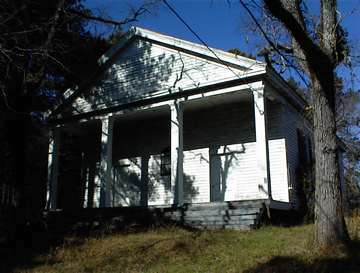 In 1969, the North Georgia Methodist Conference gave the property to the Hancock County Foundation for Historic Preservation. The combined efforts of the community and the Foundation have been made to restore this Historic old church and preserve the records. s/o C. O. & C. B. Hight. "We can safely leave our boy, Our darling, in Thy trust." "His words were kindness, His deeds were love, His spirit humble, He rests above." "Gone so soon." Only one date on gravestone. Aged 86 years. "We which have believed do enter into rest." Heb IV.8. w/o Edwin Wiley. b. Milford, Conn. "Died in faith" Heb. XI.13. Only "Baby" on this small gravestone. w/o Iverson Lovejoy. "She was too good, too gentle and fair, to dwell in this cold world of care." d/o J. M. & C. J. Hight. Space for at least 3 more graves to the northwest corner of the cemetery. s/o J. P. and M. E. Hyatt. w/o J. P. Hyatt. "A light from our household is gone. A voice we loved is stilled. A place is vacant in our hearts, That never can be filled." Numerous graves possible north of Wiley lot. Numerous graves possible east of Hight lot and north to the boundary. A native of Kingsbridge Devon. G.B. "Sweet is the memory of the just." Aged one year and nine months. On same stone as Sarah M. Beman. Aged one year. "Suffer the little children to come unto me." Christ. On same stone as Henry D. Beman. "Miss." "Her sun is gone down while It is yet day." w/o Carlisle P. Beman. "Blessed are the pure in heart." "They that be wise shall as the brightness of the firmament, and they that turn many to Righteousness, as the stars forever, And ever." "I am dying, to live forever In the Kingdom of the son of God." His last words. Aged 70 years. "Precious in the sight of the Lord is the death of his saints." "who removed from Milford in the State of CT in Nov 1816 and resided with her children in this place until 10 of July 1818 when she departed this life ae 77." the youngest child of Joseph and Ann Bryan. Age 6 months and 15 days. 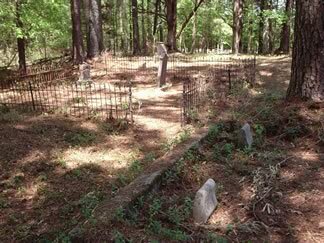 "Suffer the little children to come unto me"
Possibly other unmarked graves in this lot, which contains persons 37-42.
d/o Cole Seth and Mrs. Electa Storrs. b. Middlebury, VT. Left her native village for this place Sep 30, 1816. Died 1817 when governess of the Mt. Zion Female Academy. Aged 31 years. w/o Rev. N. S. S. Beman. m. Jun 20, 1811. Removed to Mt. Zion 1813. b. West Haven, VT. d/o Dan & Betsey Smith. Monument erected by female friends. Age 15 months, 26 days. "Beside this mother [Mrs. Lorane Smith Beman] lies interred a daughter [Lorane Strong Beman]." On same monument as Mrs. Lorane Smith Beman. Aged 80 years. "She was a Christian." Age 95 years. Kimbrough list describes as "Dr." Not seen in 2001, but grave difficult to read. Age 25. w/o Cyprian Wilcox. "She was a Christian" "In that solemn hour when the last enemy appears, what conquering power like this I know my sins forgiven." Pastor of the church in Waynesboro, Ga, and formerly Prof. of Lan. in Middlebury College VT. Died Mt. Zion, age 31.
s/o Edwin & Eliza Wiley. On same stone as E. Leroy Wiley. Age 6 years. s/o Edwin and Eliza Wiley. On same stone as William D. Wiley. Age 85 years. Grave not marked as a Revolutionary War vet, but DAR records indicate he was. N.C. Militia from Salisburg District. also Rosters of Soldiers from NC and GA. In same lot as James Patrick Hight. On same gravestone as Annie Jones Davis. No death date. On same stone as Daniel W. Davis. "Tribute of a mother's love" across top of gravestone. "She was lovely in life, And peaceful in death." Age 16 years. Grave not found in 2001. Info from Kimbrough list. Grave not found in 2001. Info from Kimbrough list.